Visual Paradigm Wins 14th Annual Jolt Productivity Award! Visual Paradigm International, a Hong Kong based company, was awarded Software Development Magazine's 14th Annual Jolt Productivity Award for its visual modeling application software, Visual Paradigm for UML. Visual Paradigm International was one of the three winners (along with Borland International and Jaczone) in the Design and Analysis Tools category, over the other finalists including IBM Rational XDE, Embarcadero ER/Studio 6.0 and Popkin Software's System Architect. 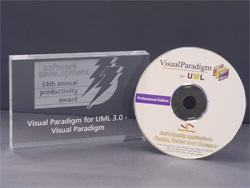 Visual Paradigm for UML was chosen as one of the 92 finalists from over 300 nominations by a team of Software Development editors, columnists and industry gurus who felt that Visual Paradigm for UML 'jolted' the industry by creating a software product that is faster, easier and more efficient. Technical Editor Rosalyn Lum commented that products nominated this year were truly exciting, representing the spirit of innovation that's still jolting the industry, despite a very challenging technology environment. For many years, Jolt cola has been the drink of software developers for sustenance during development project marathons and has been the sponsor of the annual awards presentation for the past 14 years. These awards were announced on March 17 at SD West 2004 in Santa Clara, California. Software Development Magazine will feature the Jolt award winners in the June issue. Visual Paradigm International is a Hong Kong based company and a leader in cross-platform UML visual modeling application development platform which helps developers build quality software faster, better and cheaper. Visual Paradigm products excel in the entire model-code-deploy software development process, through model driven software development. Over a hundred Fortune 500 and Global 1000 companies have adopted Visual Paradigm, and currently Visual Paradigm has over 100,000 registered users since its inception early 2002. Over 200 universities and educational institutions worldwide have also joined its Academic Partner Program including many leading universities (See a list of our Academic Partners). For more information on Visual Paradigm products, visit the company's Web site at www.visual-paradigm.com.